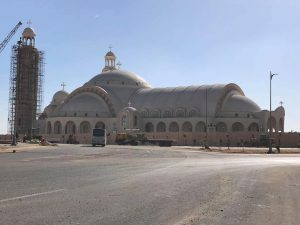 On 6 January, Coptic Orthodox Christmas Eve, Egyptian Christians celebrated the opening of the new Cathedral of the Nativity of Christ in Nasr City, 40km east of Cairo. The cathedral is the largest church in Egypt and the Middle East, and was designed to resemble Noah’s ark, reflecting a Coptic tradition of the church as a lifeboat that sails believers to the safe harbour of eternal life. It is on a huge site that includes a smaller church, multi-storey underground car park, community centre, museum and bookshops. The official opening was not the first service in the new cathedral: Christmas Eve on 6 January 2018 was celebrated in the partially-finished building in fulfilment of a pledge made by President Sisi the previous Christmas Eve. 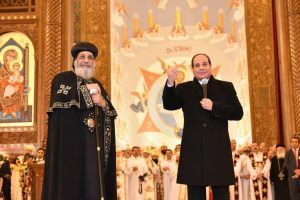 He had been visiting St Mark’s Cathedral in Abbassiya, Cairo, in January 2017 to wish the Copts a Happy Feast of the Nativity when he made the surprise announcement that the next Christmas Eve would be celebrated in a new cathedral, the biggest in Egypt. President Sisi has promised to improve the situation of Egypt’s Christians, estimated at about ten percent of the population, but they still face discrimination and intolerance as well as violent attacks, and while joyfully celebrating the opening of their new cathedral, they still call for greater protection and faster access to church legalisation. 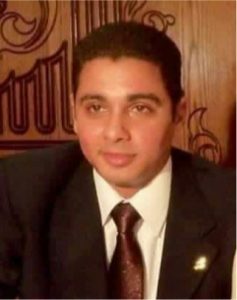 Father Polis Halim, spokesman for the Coptic Orthodox Church, recently commented, “The current administration does its best to make the Christians feel equal to their Muslim compatriots. The rights given Christians in the past four years are unprecedented in the history of our country.” However, he added that Copts have outstanding issues they want addressed, including that legalisation of churches move ahead at a faster pace. In 2016, President Sisi’s government introduced legislation to make it quicker and easier for churches to obtain permits, but the process has been hampered by slow progress and violent extremist protests. The day before the opening of the new cathedral, a police bomb disposal expert was killed while trying to defuse a bomb on a roof beside a church building in Nasr City. The bomb was one of three placed by terrorists with the apparent intention of detonating them on Coptic Orthodox Christmas Day, when the casualty rate would have been extremely high. An imam at a mosque across the street reportedly saw the terrorists preparing the bomb and alerted the police. Before he died, mine clearance specialist Mustafa Abeed was heard saying that the bombs were highly complex and explosive. Several other people were injured in the blast, including two other police officers.